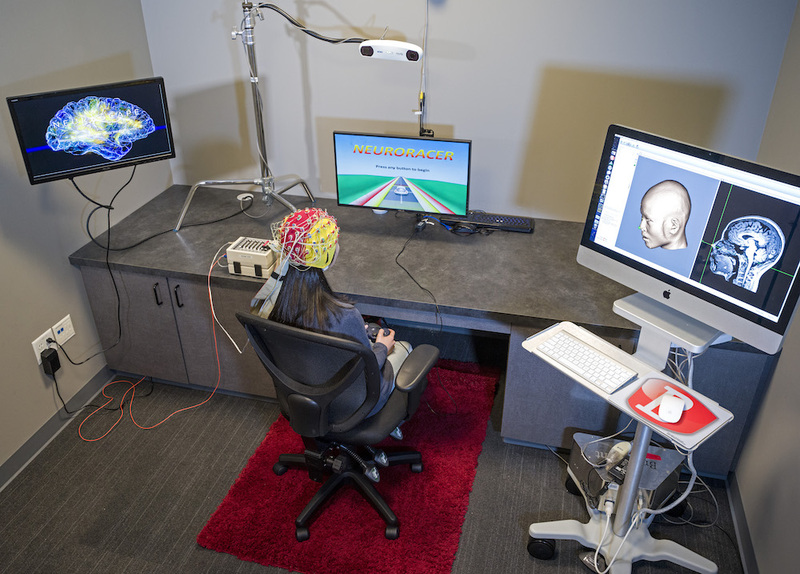 Neuroscape is located at the University of California, San Francisco Mission Bay Campus. 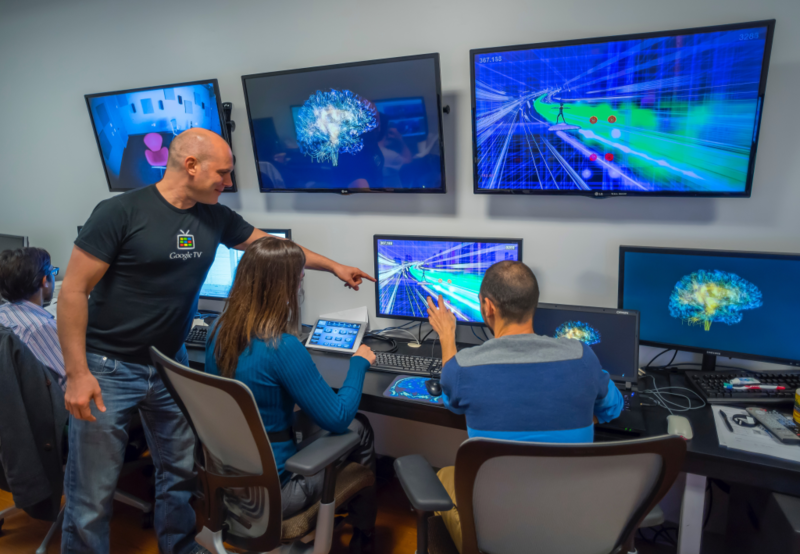 Neuroscape facilities are headquartered in the Sandler Neurosciences Center and consist of an Analytical Suite, a Development Studio, a MRI Lab and Neuroscape Research Labs. UCSF Mission Bay opened its first research building in 2003. A growing hub for the SF Bay Area biotechnology industry, it now includes seven world-class research facilitates and the UCSF Medical Center at Mission Bay (Children’s Hospital, Women’s Hospital, Cancer Hospital). Mission Bay is home to one of the largest neuroscience complexes in the world, comprised of the Sandler Neurosciences Center – headquarters to Neuroscape – and Arthur and Toni Rembe Rock Hall. 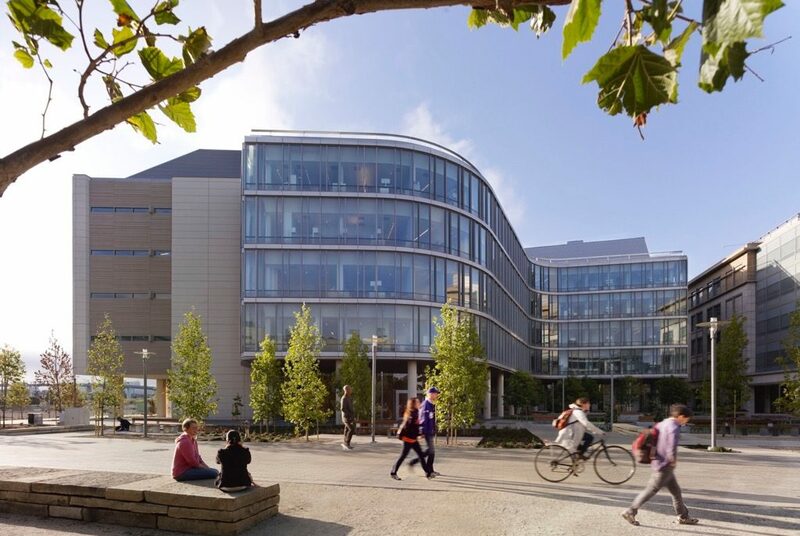 Two additional buildings will continue to expand the neuroscience community on this campus over the next decade – the UCSF Weill Institute for Neurosciences (WIN) and a new Psychiatry building. These two new sites will house Neuroscape facilities. 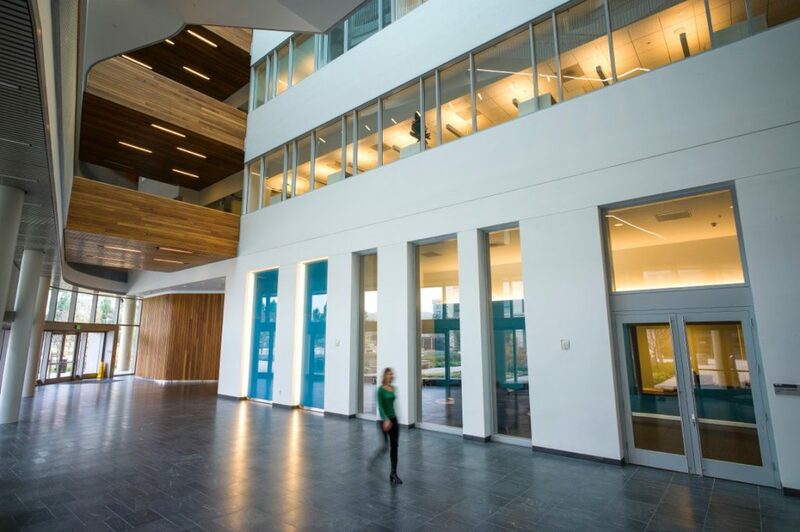 A 237,000 square foot research facility, located on the Mission Bay campus was completed in 2012. It houses about 100 principal investigators and more than 500 additional researchers and staff. 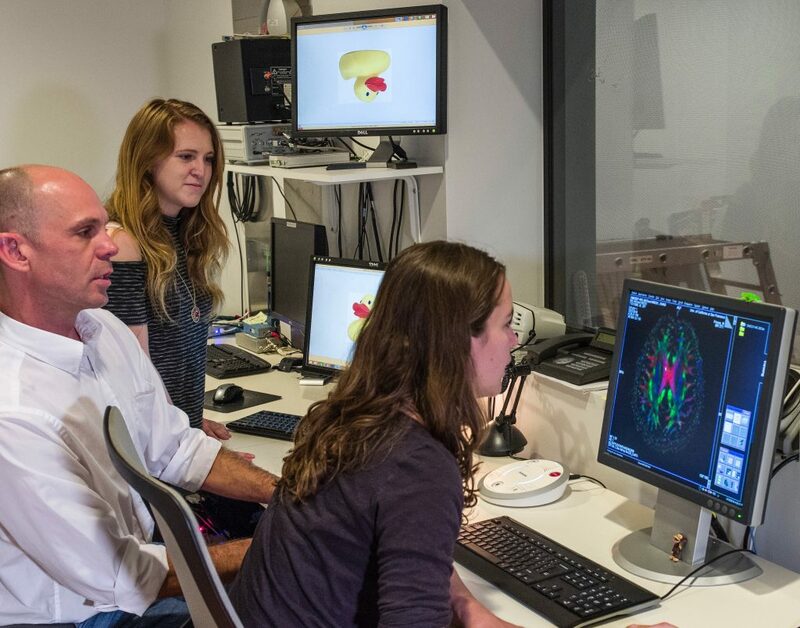 It is a home for the UCSF Department of Neurology, Memory and Aging Center (MAC), the Institute for Neurodegenerative Diseases (IND), and the Center for Integrative Neuroscience (CIN). The Sandler Building is the headquarters for Neuroscape, which includes Analytical Suites, a Development Studio, a MRI Lab and Neuroscape Research Labs. Our Analytical Suites are located on the 5th floor of the Sandler Neurosciences Center and serve as the primary sites for computational activities. It includes three rooms with twenty workstations for our Core team, as well as dedicated rack space in both on- and off-site secure server rooms. All other resources are available to facilitate research and writing (e.g., printer, copier, email, fax, on-line library catalogs). 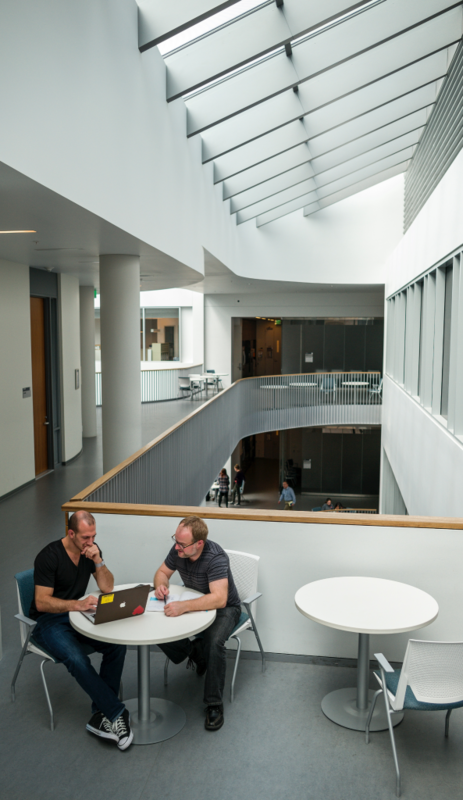 The Development Studio, located on the 1st floor of the Sandler Neurosciences Center, is the primary site of our tech development projects tasked with both creating new technologies and advancing them to our Neuroscience, Clinical, Education and Arts programs. 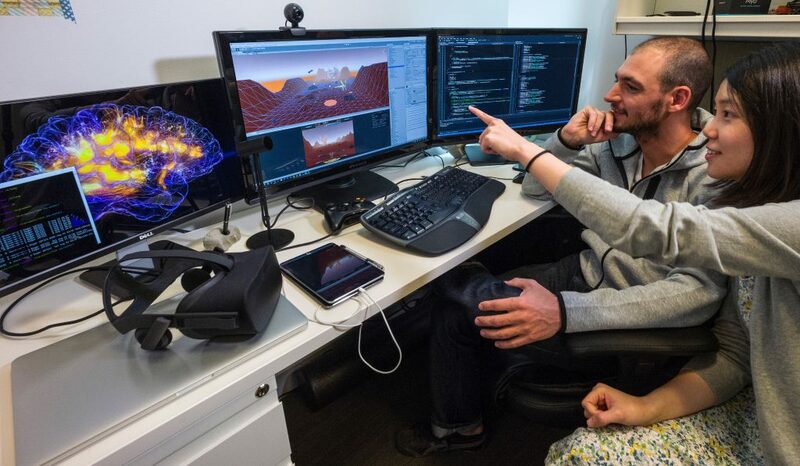 Projects primarily include video game production, VR content creation, CUDA-enabled programming, BCI algorithm creation, MRI processing and website/video content generation and maintenance. 12 Surface 3 tablets and 1 Surface Pro 3 tablet. The Neuroscape MRI Lab features a new 3T Siemens Prisma Fit MRI scanner with 64- and 20-channel head+neck coils, along with capabilities for simultaneous multi- slice (SMS) diffusion and BOLD imaging, 3D pCASL perfusion, SWI, and high-resolution anatomical imaging. The upgrade included the addition of a new XR 80/200 gradient coil capable of 80 mT/m @ 200 T/m/s simultaneously on all three axes, resulting in faster imaging in general and significantly improved SNR for diffusion imaging. The new TIM RF system with a 64 channel head+neck coil is capable of cutting-edge parallel acquisitions, such as multiband imaging, that enable higher resolution scans in reduced time with minimal artifacts. These improvements enable us to do connectome-level diffusion imaging and provide a huge improvement in the resolution of our echo-planar based scans, such as fMRI. 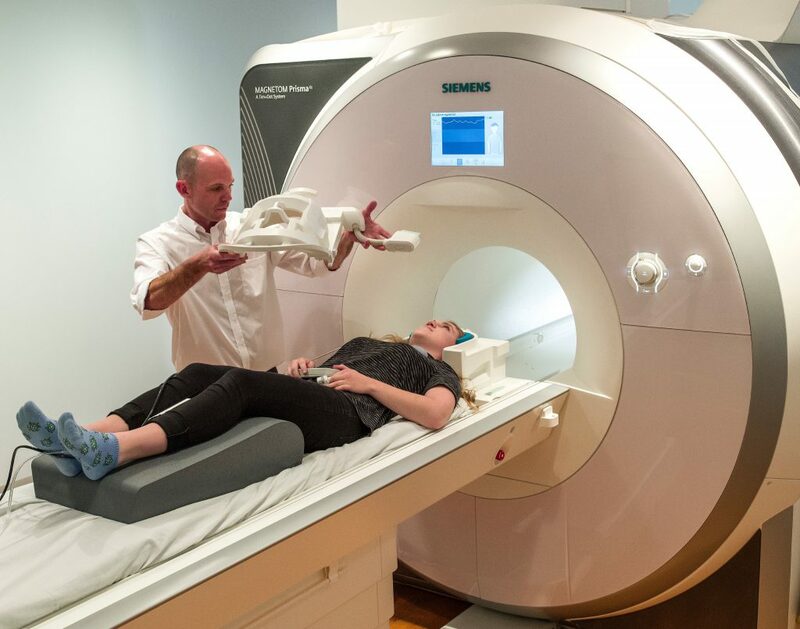 The MRI Lab has hardware and software for presentation of visual and auditory stimuli, as well as recording within the scanner of manual responses, eye-movements, galvanic skin response, pulse oximetry, respiration, EEG and EKG. The Neuroscape Research Labs (NRLs) are unique, state-of-the-art research laboratories that are designed to study novel neuro-diagnostic and neuro-therapeutic approaches. 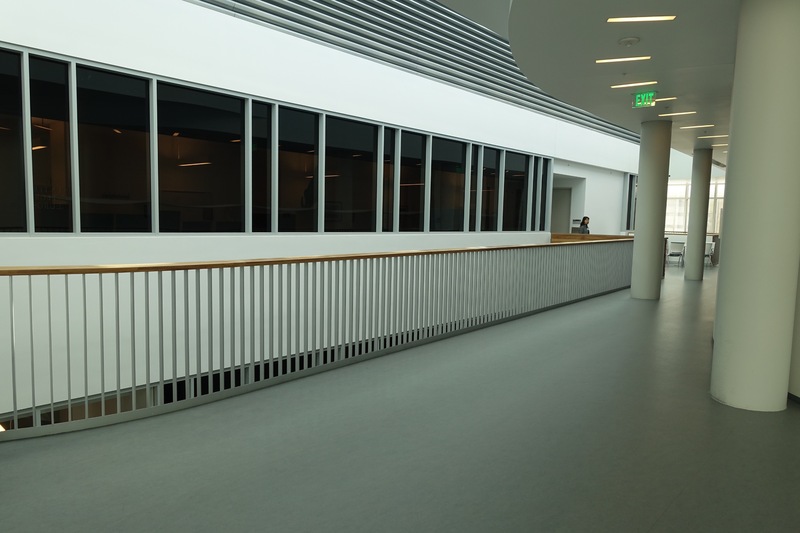 Currently, three NRLs are located on the first floor of the Sandler Neurosciences Center at Mission Bay. One is specialized for full-body motion capture (MoCap NRL) and two for multimodal biosensing (BioSense NRLs). Our plan is to serve the greater UCSF scientific community with the creation of multiple NRLs located throughout the many UCSF campuses. In the NRLs, research participants engage in customized, interactive environments aimed at more closely mimicking the natural world, but within the controlled setting of a modern laboratory. 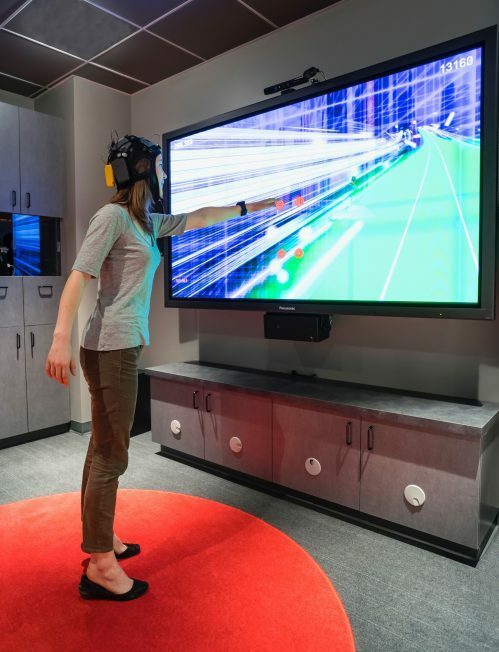 They perform experiments that merge closed-loop video games with recent technological advances in multi-sensory presentation, transcranial brain stimulation, and cognitive brain computer interfaces. Neuroscape researchers monitor these complex interactions in a Control Room via multimodal data collection devices that leverage the latest breakthroughs in consumer motion capture and physiological wearable sensors (e.g., wireless EEG, electrodermal activity, heart rate, respiration, face expression capture and eye tracking). We favor consumer-facing, mobile devices and cloud computing. The wireless and mobile approach is critical for seamless interactions and for offering the greatest likelihood of transfer of experiments to the home, clinic and classroom. The NRLs are the first of their kind; offering investigators the most powerful lab yet to study complex, dynamic interactions between individuals and the environment. Why did we create NRLS? Current approaches to studying how the human brain functions and why it goes awry in disease states usually take place in unnatural laboratory settings using contrived experimental paradigms. This hinders us from learning how the brain actually functions in our daily lives. 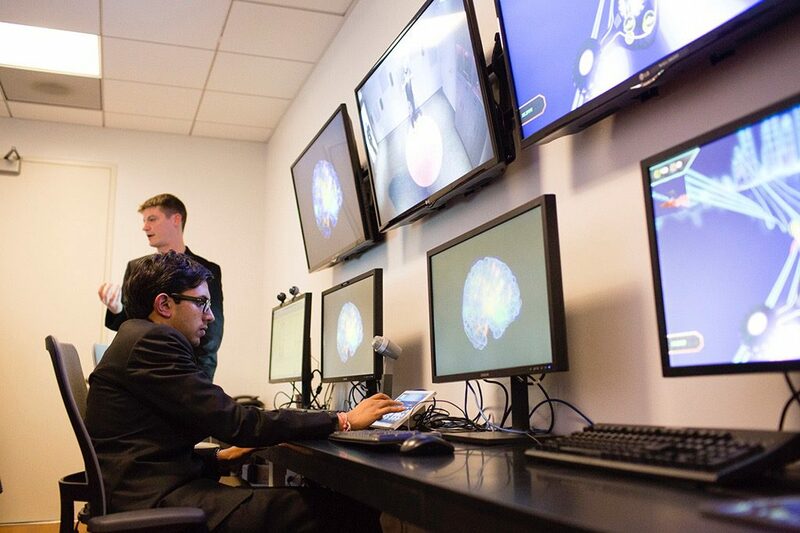 A high-tech approach to neuroscience, which integrates richly simulated environments, full-body interactivity, and the latest in physiological sensor/motion detection technology, all within a world-class neurological/psychiatric research center will also serve as a unique platform to create and validate novel therapeutics. 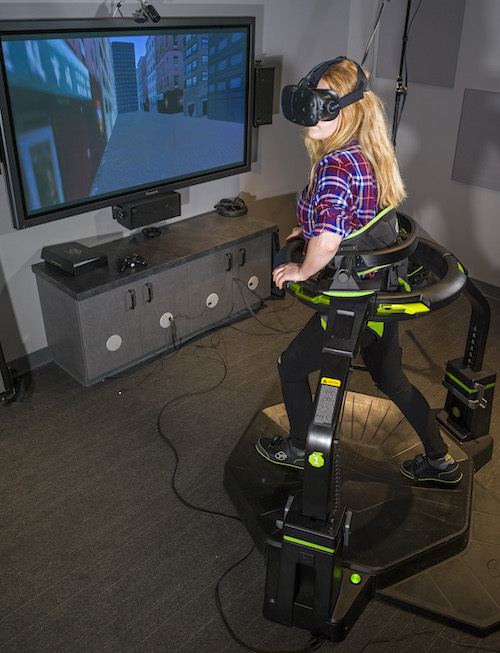 The motion capture NRL (12′ x 24′) is primarily used in experiments that involve the integration of immersive sensory environments with full-body interactions. Two acoustically-shielded BioSense NRLs (10’ X 12’) are primarily used for multimodal data collection (stress metrics, cognitive assessments, brain activity, eye-movements….). These data often serve as outcome measures to assess the impact of our training studies. iMotions Biometric Research Platform (imotions.com) to collect synchronized biometric data (EEG, GSR, ECG, and eye-tracking) time-locked to stimulus presentation. An adjoining, common control room (10’ X 24’) with audio/visual connectivity is used to direct the research experiments that are performed in all three NRLS.